By now you’ve probably heard that Les Paul has passed away at the age of 94. You can google him to find out all about his life, his accomplishments, and his death. Here, I’ll talk about who he was to me. As I pull up a stool at the Tiki Bar and make myself comfortable with a Chivas-Regal on the rocks, I begin to remember the first time I ever heard the name “Les Paul”. I was around 12. I had just started playing clarinet, learning by listening to Benny Goodman and Artie Shaw records and trying to mimic them. I had gotten into big band music and jazz just about a year or so before, and had discovered an “oldies” station on the radio, WRDR FM-105 out of Egg Harbor City, NJ. They played everything from Glenn Miller to Stan Getz, Bing Crosby to Julie London. 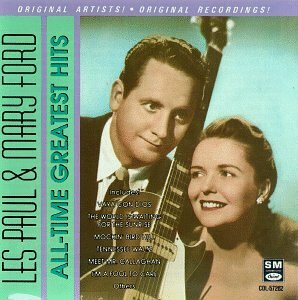 Occasionally they’d play a tune from a husband & wife country-sounding duo, Les Paul and Mary Ford. “The World Is Waiting For The Sunrise” and “How High The Moon” are the two tunes that they played most often, and that still stand out in my mind. The announcer, I believe his name was Dan Morrow, would add a little trivia when he played his records. It was from him I learned that Les Paul played all the guitar tracks on those tunes, and did something that most people had never even thought of…he recorded on magnetic tape, each instrument separately, then layered the sounds together. He basically developed (possibly invented) audio multi-tracking. Along the line I heard more about this musician/engineer…first that he invented the electric guitar (he didn’t, but he invented pick-ups that made the electrified guitar sound much better and clearer), then that he played all the guitar sounds on one instrument at the same time (no, he tracked them!). I heard Eddie Van Halen idolized him. That I believe. That crazy picking sound he developed was different than most guitarists were doing in the 30’s and 40’s, so he developed his own style to go with the instruments. That’s pretty damned impressive in my book. When I got to high school and started playing in the band, friends of mine who were guitarists would always talk about Les Paul, and having a Les Paul Gibson guitar. Most of my friends couldn’t afford them, but they always wanted them. Those conversations led to my learning things like the difference between a hollow body and a solid body, how the pickups worked, and how different sounds could be obtained by using different combinations of pickups, amp settings, and effects boxes like flangers (I learned most of this from my buddy Tom McGinty who still plays guitar now). I never learned to play guitar, but the info came in handy on a lot of occasions. I have a couple of Les Paul 78’s. When I think that this guy was recording and experimenting with electronics in the 1930s, and that he just passed away now in 2009, I’m amazed. What an incredible life, to pioneer something that has become so integral in the world’s society, so much a part of history, pop culture and technology. Without Les Paul and others like him, the guitar would have remained a background rhythm instrument in 20th century pop music, and may have never taken its place as a lead instrument. Rock n Roll would never have developed as it did. Bill Haley may never have become a star. Paul Simon, Jimmy Hendrix, Wes Montgomery, Brian Setzer may never have played an instrument at all, or if they did they may never have become famous. Or worse. Could you imagine Jimmy Hendrix on Tuba? All this because 70 years ago a guy decided he wanted to make his guitar louder. The world thanks you, Les. And we’ll miss you.